Last week, I had the opportunity to facilitate another one of my Leadership Experiences – this time for 16 members of the leadership team from SOLitude Lake. A rapidly growing organization of 400 employees, SOLitude held their annual company meeting in Virginia Beach and kicked it off with 3.5 hours of “management therapy”, as some organizations have called it, with me – focusing on communication, individual responsibility, trust, and teamwork. Since the event was closed to the public, I want to share with you a few of the topics and lessons that came from this experience. Do you have the courage to pursue the highest expression of your being? People don’t admire leadership. They admire courage. Here’s a little secret: Courage is a prerequisite for leadership. A coward never made a great leader. Do you have the courage to have to the tough conversations – Internally and externally? Leadership is an energy, not a position. An energy of humility, service, and a commitment to the mission and continual progress. Here’s one of the biggest lessons of the day. We can’t have teamwork without trust. And we won’t trust another human who does not show us through their actions that they have the ability to lead themselves first. 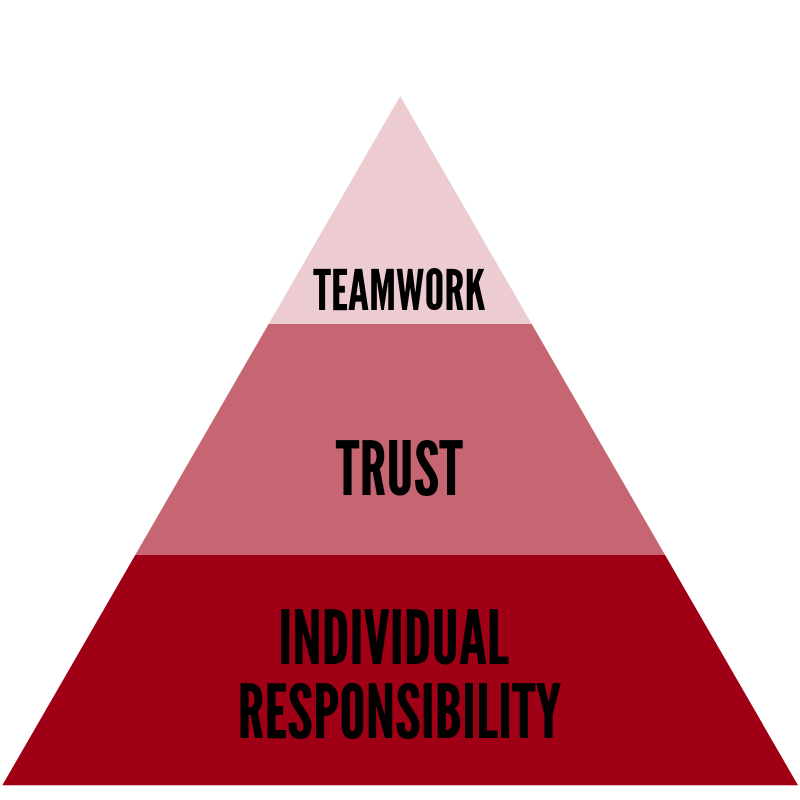 The pyramid that you see above represents the hierarchy of high functioning teams and organizations. Individual responsibility, trust, then teamwork. Individual Responsibility. Everything we do, we do to (or for) the team. How do your actions and choices affect the team? Scaling requires us to remove selves as bottlenecks. Document what you do and create Standard Operating Procedures (SOP) to “Train the trainers”. Simplify communications into messages that cannot be misunderstood. Weekly and monthly meetings need defined objectives. Leadership = Courage. Have the courage to have tough conversations. Have the the courage to lead. Focus on ACTIONS not outcomes. Want to experience 2 days of Leadership and Development with me? Join a handful of other leaders and me for the first public iteration of these Leadership Experiences on April 6-7 in Winchester, VA.